Amazon is well know and highly appreciated in the IT world for its cloud computing offerings such as its EC2 services. As a part of these services, Amazon also offers a range of hosted DBMS solutions (DBaaS, DB as a service), which become more and more popular among developers. This is best seen when we pick out the Amazon systems from our DB-Engines Ranking. The Amazon services listed in our ranking do not include the classic Amazon Relational Database Services (RDS), where Amazon offers to run Oracle, MySQL, PostgreSQL or Microsoft SQL Server in the cloud. Entries in our ranking need to provide their own technology to be seen as separate DBMS system, and Amazon does provide a fine range of such systems. This comes as no surprise, because the classic Amazon Dynamo paper attracted very much attention in 2007. Many people see this paper as one of the starting points of the NoSQL movement. There is, obviously, no lack of competence within Amazon when it comes to DBMSs. Amazon DynamoDB is the most popular of them, climbing to rank 28 in August, up from rank 32 one year ago, thereby overtaking Microsoft's flagship DBaaS product Microsoft Azure SQL Database. DynamoDB is built on the principles of Dynamo, as outlined in the above paper, thus providing a scalable, hosted NoSQL solution. 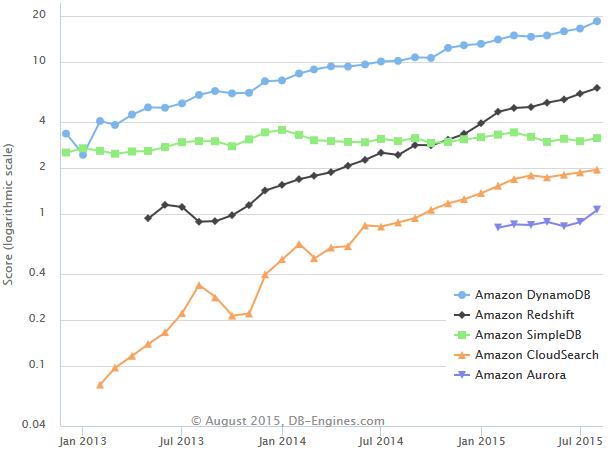 Amazon SimpleDB had a stable ranking score in the last year, losing a few ranks and stays now at rank 64. As the name suggests, this is the most simple of Amazon's DBMSs, lacking the scalability and performance of the other systems. For certain applications, however, that's just what is needed. Amazon CloudSearch is Amazon's search engine, climbing from rank 91 to 78 in the last year. At rank 8 in the Search Engine ranking, it is just ahead of Microsoft Azure Search, the second hosted system in that category. Amazon Redshift, Amazon's hosted data warehouse solution trebled its ranking score in the last year, bringing it up from rank 58 to 40. Amazon Aurora is the youngest of Amazon's offerings, just leaving the preview phase last week and already at rank 112 (out of 280 systems) in our ranking. Time will tell whether this RDBMS with its MySQL-compatible interface can compete in that field. When it comes to hosted database solutions, Amazon is at eye level or even ahead of the other giants in the industry such as Oracle, Microsoft, IBM, SAP and Google. However, the competitive DBMS market is changing fast, and also includes quite a few successful and ambitious niche players. The momentary boost in popularity for Amazon's systems is certainly no guarantee for long-term success.